I have limited myself to write these blog posts focusing on one text through one day (see my previous post), and the day I had time for it this time was while sitting on a train without my computer at hand, so under here you can find links to my handwritten notes. I tried to make them as understandable as possible. Screen drop from Limited Inc on Google Books. First Sgt. Edward Welsh: Hey Witt, who you making trouble for today? Private Witt: What do you mean? First Sgt. Edward Welsh: Well, isn’t that what you like to do? Turn left when they say go right. Why are you such a trouble maker Witt? Private Witt: You care about me? Don’t ya Sergeant? I always felt like you did. One day I come up and talk to ya. Then the next day it’s like we never even met. Lonely house now, you ever get lonely? Private Witt: Only around people. First Sgt. Edward Welsh: You still believin in the beautiful light are ya? How do you do that? You’re a magician to me. Private Witt: I still see a spark in you. It’s probably this spark, which some people have called “this inner drive” (“this inner drive comes not from the years of education or any other sort of conditional factors, but because of the inner spark within each Jew” (http://bit.ly/1JBAn08)) I see too, weather it’s in a grandious work of art as with Kubrick’s 2001: A Space oddysey, which Arthur C. Clarke described in this way in the process of making it: “a work of art which would arouse the emotions of wonder, awe … even, if appropriate, terror”, or it is the self assure brave (maybe necessary) cheeky character of first Sgt. Edwar Welsh. This is more like “a passage or opening”, to use Derrida’s formulation, and not something one can communicate in clear words. I’m sure you can provide plenty of other examples yourself which describes similar phenomena; with film, literature, relations and experiences from the shock value of extraordinary events to the repetitative atmospere of everyday life, which can be about anything; religion, emotions, memory, death. In my case it seems to derive from a fascination on jews (by the way I’m not jewish myself, I sometimes compare my situation to Kramer’s in Seinfeld who neither is jewish by birthright, but has adopted their culture because “I agree with the concepts and the religious beliefs of Judaism and I’ve adopted Judaism as my religion,” in my case: change “agree” with “am curious about”, “Judaism” to “jews in arts and culture” and “religion” to “muse”). Next post will be about Derrida’s text «Signature Event Context» and published sometime during September. Inspired by Beck Hansen’s project Record Club which purpose was to cover an entire album by another artist in one day, using an informal and fluid collective of musicians, I will this autumn blog as much as I can in one day about a philosophical text connected to the book Limited Inc by Jacques Derrida. Due to the construction of Derrida’s book with the critical opening essay on J. L. Austin, I will begin with reading the text How to do things with words: the William James lectures delivered at Harvard University in 1955 by J. L. Austin, posthumously published in 1962. This post will be published sometime during this month. 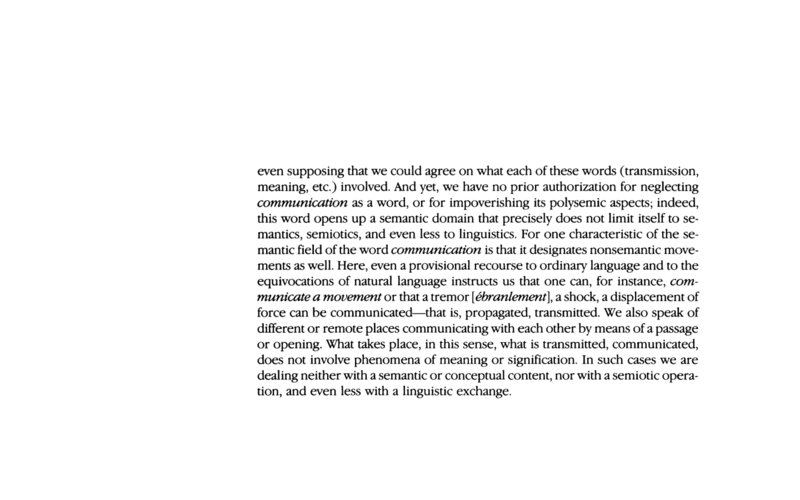 Meanwhile you can watch this poetry reading and take notice at 20:25, were poet Charles Bernstein reads «Language, Truth And Logic», a poem inspired by philosophical concepts including J. L. Austin’s distinction between to do something “by accident” and “by mistake”. The word «recon» is, chiefly US, military slang for «reconnaissance», the exploration outside an area occupied by friendly forces to gain information about natural features and enemy presence. I needed a word that resembled Beck’s «Record Club». Furthermore it fits the heated debate between Jacques Derrida and John Searle that the book Limited Inc is swept in.